Well, the title has changed again for a new and third draft, so welcome everyone to The Midnight Cure. I think this is going to be it, and then begins the huge undergoing of editing. Kinks have been hammered and worked out in subsequent drafts 1, 1.5, and 2. Once I’m about a fourth way through this I’ll start posting (though not consecutive) chapters. My goal is 5000 words a week and I intend to not meet it up until December where I expect to finish. As an aside, my artist sent me more sketches for the cover, and this time it came with characters! 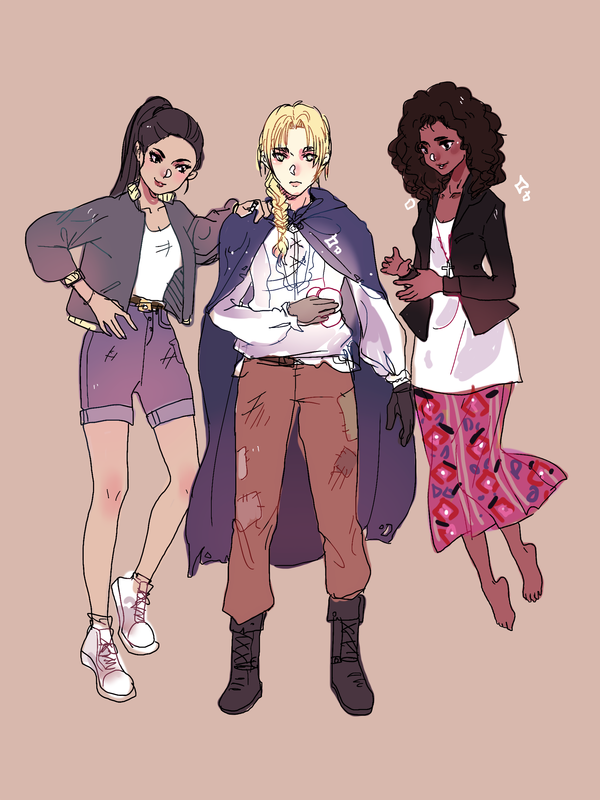 From left to right: Violet, Ivor, Aerinetta. Violet is an Indigenous American, next in line for the title of Ayana, and is a prodigy in her generation of magi. Due to the unscene consequences of saving Ivor’s life as a child, she now must become his Master and teach him the power of magi. This on top of living a double life, deciding what she wants from her future, and mending the relationship with her sisters has, in her opinion, made her life a drag. Ivor has spent seven years in the Borealis searching for a cure to immortality. With all his attempts ending in failure by using folk magic, he’s begrudgingly returned to Earth. His identity, purpose, and true power must all be kept secret if wants to keep those around him alive. Aerinetta is one of Ivor’s Guardians and has believed in his fight against fate since day one. She hasn’t seen him in years and is unsure of the man he’s become while being in the land of Fae. She fears the day she may learn of something that is irreversible, and must preform her duty as an Angel of Death. If any of my characters interest you, there’s many more in The Midnight Cure full of magic and secrets! Check out my prequel chapters if you haven’t already, and happy writing!